SKU: 2437. Categories: Shang Bronzes, Shang Dynasty. Late Shang Dynasty c.1300-1050 B.C. Rising from a splayed stepped ring foot, the pot-bellied pear shape body, oval in section, contracted at the neck then flared out to the short straight lip, covered by an arched lid with a bovine shape handle in the center. A frieze of kui -dragon pattern located between neck and belly, seen in profile and executed in low relief on a spiral leiwen ground, punctuated by two mythical animal heads cast in high relief on each side in the middle. The taotie head was cast with large coiled horns, a facial ridge marked by a diamond as nose, leaf-like ears at the sides, protuberant eyes marked by a fine horizontal incision as pupils, and a broad upper lip. Beside the head were two dragons shared one tail, the kui -dragon next to the head was cast as head turned to the rear, presented with long muzzle, long horns, linear body with curly branches as leg and claw, boss as eye and a rising tail, the other kui -dragon was mirror-symmetric with the former one by the tail but looking the same direction. The frieze is underlined by a convex bowstring pattern. A similar band of decoration cast near the edge of the cover, under a convex bowstring pattern. Instead of taotie heads, two vertical short flanges symmetrized the pattern and the confronted kui -dragons are separated and all looking backwards. The flared ring foot was encircled by elongated abstract dragon scroll motif, mulei pattern, with centering eyes in raised bosses, confronted by a fine ridge on each side. Overall in brown, burgundy and green patina with spots of cuprite and malachite crystallization and textile traces. Besides its large size, the most unique part is the bovine shape handle on the lid. Likewise oval in section, the convex cover is punctuated by a fabulous animal sculpted in the round in the center. Of bovine type, the animal has its hind legs powerfully braced, and it is kneeling on its bent forelegs. The upright head has pointed ears and wide horns incised with motifs. The large eyes are wide open and the mouth is tightly closed. The broad muzzle is marked by incised nostrils. The body is decorated with deep incisions which underline the shoulders, abdomen and haunches. The rather broad tail descends from a powerful rump. The bovine was sculpted vividly and looks like it is about to rouse. Two identical inscriptions of two characters was cast in the interior of cover and the base of body reads Fu Geng in Chinese, which indicates the consigner made this piece in memory of his father. Zhi is a kind of wine vessel like jue and gu , but much less in number, the ones with cover are even fewer, let alone the handle on the cover is an animal sculpture in the round. It is scarcely any zhi has the similar size, design and pattern. 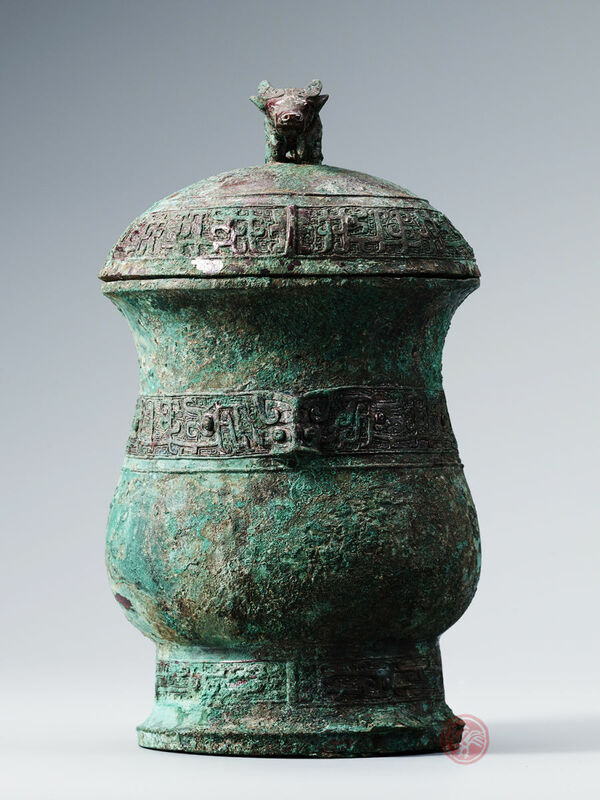 A bronze zhi , without cover, excavated from Sichuan in 1959 has similar shape and motifs, illustrated in Wang Jiayou: Ji Sichuan peng xian zhu wa jie chu tu de tong qi (Discussing the bronzes unearthed at Zhuwajie in Peng Xian County, Sichuan), Cultural Relics, 1961(11), pp.28-33, pl.3:middle. A carving of buffalo in marble from Anyang M5 holding the similar position with this one, see Jessica Rawson, Western Zhou Ritual Bronzes from the Arthur M. Sackler Collections, vol.IIA, 1990, fig.42, p.41. 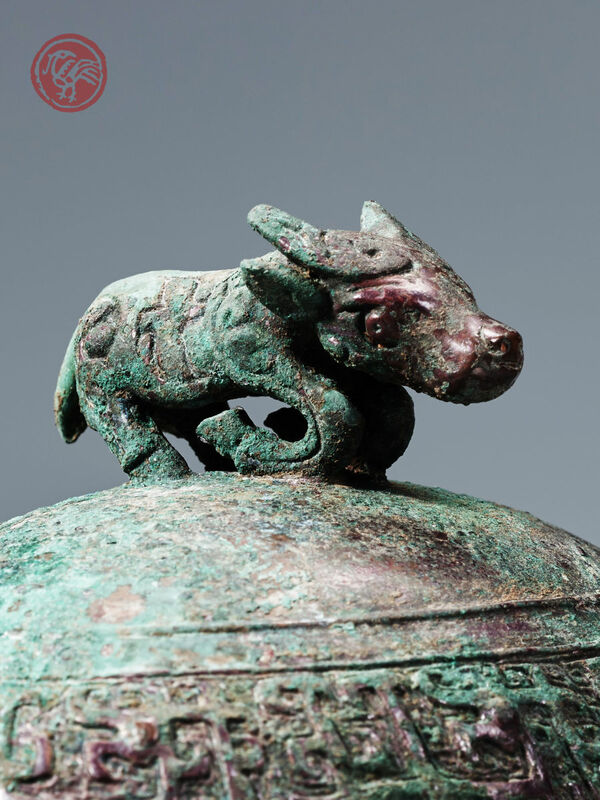 Gisele Croes: Treasures of Ancient China, Paris, 2002, vol.II, pp.16-17.